Last night I got all excited about Multiplicity, and I still think it was an appropriate response on my part. However, someone pointed out that thereâ€™s no need to wait, and then pay for Multiplicity. There is already a free open-source application that does most of what Multiplicity claims to do. This application is called Synergy. Of course, Synergy feels like an open-source project as it lacks a very friendly user-interface, and has a few stated bugs. It does get the job done though! I got it working with my Windows desktop and OSX Powerbook tonight, and it is very exciting. I can control both computers with the same keyboard and mouse. Between the two computers, I have three displaysâ€¦ two belonging to the Windows machine. Check out Synergy if youâ€™ve got more than one machine and display laying around. If you desire more polish than it offers, at least play around with it until Multiplicity hits the market. Multiplicity – Dual Display? Try Dual Machine! I was about to hit the sack when my buddy Herb threw this link at me. Itâ€™s a post up at WinCustomize.com by Frogboy. In it, he is describing a new product by the software company Stardock called Multiplicity. I highly recommend you read Frogboyâ€™s post. Multiplicity is an application that will let you seamlessly use two (or more) computers with one keyboard and mouse. 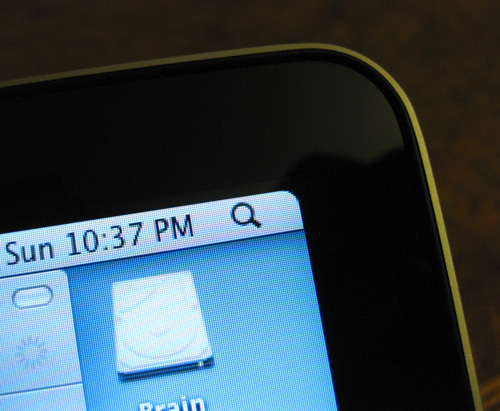 Anyone with a dual display setup on one computer will already know how this works: you have two displays and you can move between them by simply dragging your mouse to the edge of one screen, where it then pops up at the edge of the other. Here’s an example, my setup on my windows machine. 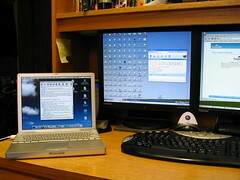 Multiplicity promises to provide the same seamless switching between displays, but the difference is that each display is hooked up to its own computer. Thatâ€™s rightâ€¦ You can control multiple computers with a single mouse and keyboard, simply moving across each desktop as you would on a multiple display configuration. This means you can render a 3D scene on one box, and hop over to your other computer to have an IM conversation or web surf, each process happening on a separate machine. Multiplicity doesnâ€™t stop there. ItÂ also merges your clipboard between all of your machines. If you highlight text and hit copy, you can move your mouse over to another computer and paste that text. This actually applies to ANY clipboard data.Â The â€œProâ€ version (which of course costs more money) extends this to files and directories! No more network shares or network storage space to deal with. As I read through Frogboyâ€™s post I held my breath waiting for the bit of news that would ultimately determine if Multiplicity would be of extreme value to me or not. And then I found the combination of words I was looking for: â€œ â€¦you can now control a PC and a Mac together .â€ Thatâ€™s right, Stardock is currently in development of a Mac version of Multiplicity that would work along side of the Windows client. This is extremely exciting for me, as I know it must be for thousands of others, as I have a windows box and an OSX Powerbook on my network, and being able to control both from my desktop mouse and keyboard would certainly be worth the price of admission. I havenâ€™t seen word of a Linux client, but if this tool saturates the market as proficiently as I expect it will, then I donâ€™t imagine that such a client would be far behind. I also believe that running two (or three) different operating systems together may pose problems with the clipboard working as described above, but I trust the engineers can find a solution, and judgment shall be reserved for the final product. The ship date for Multiplicity is currently set for February 21. Stardock is taking pre-orders for the product (I donâ€™t really see the logic behind offering pre-orders on an electronically distributed product, but to each his own) at the price of $39.99 for a two computer license and $69.99 for the â€œProâ€ version, which gives you clipboard and file copying ability as well as a license for three or more computers. A demo is in development and should be available shortly.